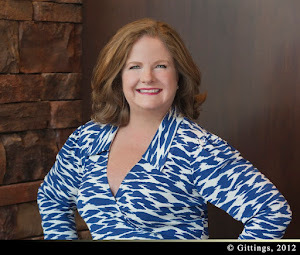 Paige McDaniel's Blog: OMG! Oprah and Me? Really? If you are a regular reader of this blog (and I know that there are literally TENS of you), then you know that I love Oprah. I admire her. She is a mentor to me even though I've never met her. NOTE: Of course, I did try to see if I knew anyone who could have gotten me backstage, but no luck. NOTE TO SELF: Get some fancier friends. Pronto. My sister-in-law Lucy and our friend Lori went with me that morning. I bought our tickets at Ticketmaster ($100 each, plus fees, plus $25ish for parking) and I bought them the same morning I got the email from Oprah telling me to buy them. NOTE: Yes, I mind Oprah. She needed me there, otherwise I'm sure she wouldn't have come to Dallas. You can thank me later. These seats were the best you could buy and there were no floor seats available at that time (you know I would have done it -- budget be damned). Next, skip to the night before -- Wednesday night, August 28. I called Lucy and told her I'd pick her and Lori up that morning. I told Lucy that I thought we should look pretty cute just in case they had scouters looking for good looking people (don't laugh -- we can look pretty good when we want to) to sit down front (I've upgraded to first class a few times, people.). I also know that back when they used to tape The Oprah Winfrey Show they always asked people to wear color (not black) so Lucy and I were ready. I wore flats, slacks (no jeans), a turquoise Tory Burch sweater and a chunky necklace (this is pretty much my casual uniform). Lucy had on white pants and a blue and black patterned top. Lori wore a colorful top and white shorts (I guess Lucy forgot to inform her of my plan to stand out for the front row scouts, but I would have left both of them in the dust if the scouts singled me out, so NBD.). Everyone looks WAY nicer than we do. Tons of people in dresses and heels -- fabulous color everywhere. I know immediately that the seats in Section 117, Row N, seats 3 and 4 are ours for the duration. NOTE: Lori got her ticket a few weeks later and wasn't sitting with us. So, Lucy and I find our seats and settle in (as much as you can since we are having to stand up every 5 minutes letting ladies in and out of the row). Every electronic sign in the place is telling us to "Tweet Live with the Hashtag #Lifeclass". There is peppy music playing (Blurred Lines, Gaga, etc.) and you can tell everyone is super excited. 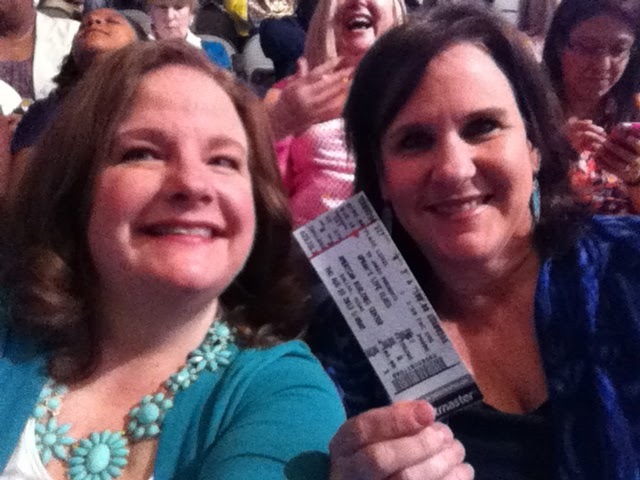 One of my neighbors is sitting behind me, one of Joanna's friends is on my row, and I saw another friend as we were leaving -- there were tons of people I knew in the joint of 15,000 people. NOTE: For this post, I'm just going to give you the report of how they made the show and my impressions, not really talking about the content (which was great, BTW -- be sure to watch it on OWN this Sunday for part 1). I'll talk about content in future posts for sure, though. Bishop Jakes was fabulous. hilarious laugh -- I got a few head turns from our section during this. I'm a great audience member. Actor friends always tell me that they hear me laugh and hoot when they're on stage. She then said that if you end up commenting to keep your comments general, like don't say "my father" say "a family member" and she said that if you comment, you need to stay after to sign. NOTE: No one who wasn't approved in advance spoke people, so this wasn't necessary. Just gave me a little more false hope for a potential meeting with Oprah. Drat. 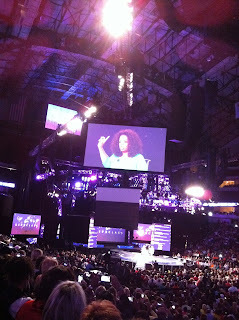 The gal talked to us about keeping up the tweeting (#Lifeclass was trending even before Oprah came out, so it worked). NOTE: Of course, I was tweeting up a storm, thank God -- you'll know why I'm thanking God later. 9:30 am: A comedian did a short set. 9:45 am: An inspirational dude spoke to us -- got the crowd worked up. 10:00 am: Oprah takes the stage with Bishop Jakes! The crowd goes wild! She was wearing a gorgeous green dress, V necked with 3/4 sleeves, great shoes (at least the lady behind me liked them -- she had binoculars, I didn't). Super exciting. As I mentioned, I am tweeting up a storm (feel free to check out my twitter feed at @paigemcdaniel -- you can see them all there from August 29) and I even see my picture go up on one of the screens behind Bishop Jakes (across from Oprah), and I nudge Lucy that I see one of my tweets, but it is too far away to read it, of course. The feed of tweets is ever changing and up until this point Oprah had not read any of them out loud. BUT THEN IT HAPPENED -- Oprah read my tweet out loud! NOTE: I can't wait to see the show this Sunday night because what if someone else wrote the same thing and really she was reading theirs? But I just know it was mine, at least for now. And I need this -- it's been a hard week already. At least until next time Oprah is in town. My search for fancier friends is on. You go Paige.. love this.. ! what a fun post. Thank you, Yvonne -- you know I asked Jeanne if she was going and if I could be her assistant, but she told me I was the MSC rep!